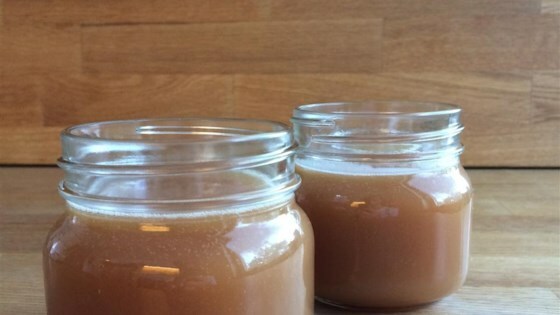 "This is an easy and yummy salted caramel sauce. Perfect for topping any dessert." Pour sugar and water into a small saucepan; swirl gently to combine. Heat over medium-low heat until little bubbles form on the side. Increase heat to high and boil until sugar turns amber, 5 to 8 minutes. Remove from heat and carefully whisk in heavy cream. Add butter and salt, stirring to combine. Pour caramel into a glass container; let cool. See how to make the world’s best topping for ice cream! Be careful: caramel will bubble vigorously and may splatter when you add the heavy cream. Turned out awful. The directions should say do not stir while sugar is cooking. I got that from the reviews but it should be in the directions. Follow the directions and this sauce will work out perfectly! One thing I will say is I added a tbsp of vanilla, to add a little extra flavour. It turned out great! I followed the instructions to a T! It was very simple to make but I do have a little experience so that helped. I used 1/4 c. Water and 2/3 c. Heavy Cream. It turned out great!